In stock -This product will ship today if ordered within the next 6 hours and 42 minutes. Nutiva`s raw, unrefined, expeller cold-pressed Canadian Hemp Oil is light green in colour, lighter in flavour and has a higher GLA content compared to other hemp oils. It is also housed in a dark glass bottle. Hemp oil has nature`s ideal 3:1 omega-6 to omega-3 ratio. Unlike flax, hemp has valuable super omega-3 (SDA) and super Omega-6 (GLA), which can help the body metabolise fat. Nutiva went out looking for the kind of foods that packed a powerful amount of nutrition into every bite, so that you could make small changes to big effect. They found superfoods - nutrient-dense powerhouses that can also be grown and processed in a sustainable way. These are foods that are truly good for you and for the planet. They’re organic, full of vital nutrition, easy to use and delicious additions to your diet. Raw, Organic, Unrefined Canadian Hemp Oil. Use hemp oil in smoothies, salads, vegetables and pasta dishes. To conserve the essential fatty acids, we suggest you use it raw or gently heated. 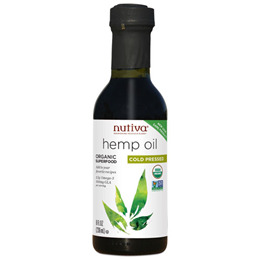 Below are reviews of Nutiva Cold Pressed Hemp Oil - 236ml by bodykind customers. If you have tried this product we'd love to hear what you think so please leave a review. Excellent quality of hemp oil and gladly in a glass bottle rather than plastic.